NEW COLUMN: "Riley's Ramblings," by Riley Hollingsworth, K4ZDH If wintertime is antenna season for the higher HF bands, then summer must be antenna season for the low bands, which are at their best when the weather turns cold. 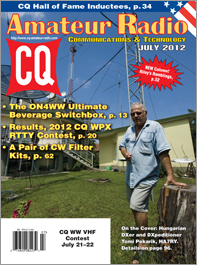 With that in mind, the July issue of CQ starts out with "The ON4WW Ultimate Beverage Switchbox," by Luc Smet, ON5UK, about his project to improve antenna switching for ON4WW's massive 160-meter array (eight Beverage antennas, spaced every 45 degrees around the compass). A variation on the theme by LA4HIA is posted on our website as a "Digging Deeper" article – click here to view. Next, we have the results of the 2012 CQ WPX RTTY Contest, which featured over one million QSOs (a 25% increase from 2011) and more than 3500 logs received. 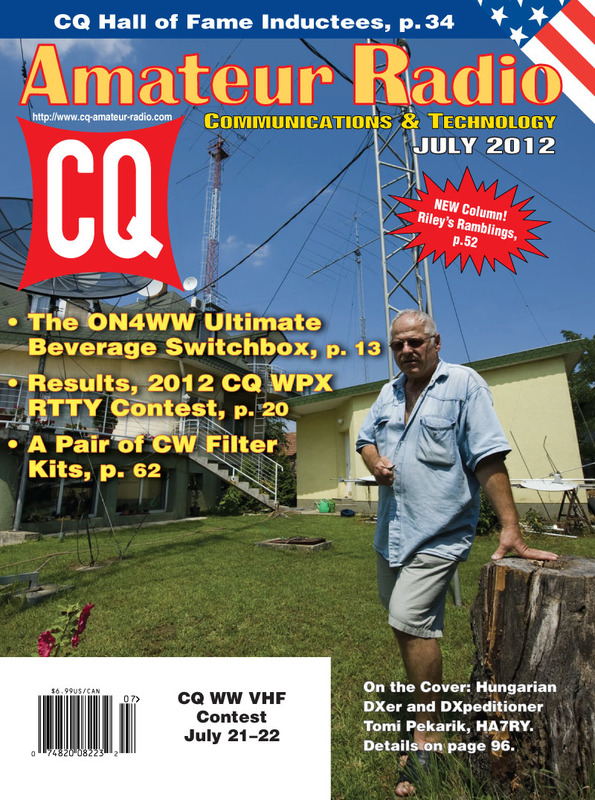 We also have the rules for the 2012 CQ World Wide RTTY DX Contest, coming up this September. As we do each July, we introduce the newest members of the various CQ Halls of Fame. 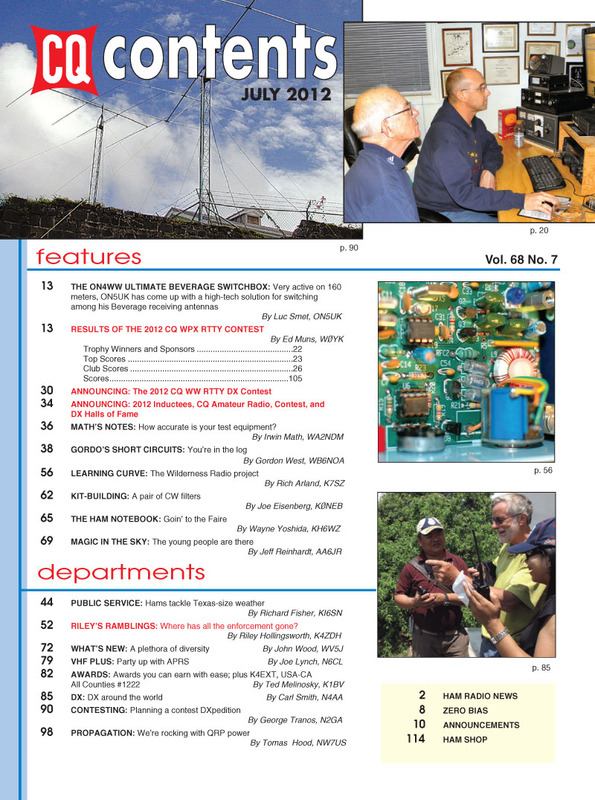 We have 16 new inductees this year to the CQ Amateur Radio Hall of Fame, two new members of the CQ Contest Hall of Fame and three new members of the CQ DX Hall of Fame, which is celebrating its 45th anniversary this year – click here to view. Among our columns this month, "Math's Notes" editor Irwin Math, WA2NDM, asks, "How Accurate is Your Test Equipment?" - "Gordo's Short Circuits" by Gordon West, WB6NOA, features logbooks for portable operating, and Public Service Editor Richard Fisher, KI6SN, covers the ham response to tornadoes in the Dallas-Fort Worth area. We have a brand new column - and columnist - as of this month: Former FCC amateur radio enforcement chief Riley Hollingsworth, K4ZDH, joins our staff with "Riley's Ramblings." In his first installment, he explains why FCC enforcement efforts seem to be "under the radar" in the recent past. "Learning Curve" editor Rich Arland, K7SZ, looks at building the NC-40A portable QRP transceiver; Kit-Building Editor Joe Eisenberg, K0NEB, checks out a couple of CW filter kits, and "Ham Notebook" editor Wayne Yoshida, KH6WZ, writes about "Goin' to the (Maker) Faire." "Magic in the Sky" editor Jeff Reinhardt, AA6JR, writes about a teacher who's using innovative techniques to introduce students to electronics, New Products Editor John Wood, WV5J, looks at "A Plethora of Diversity" among new goodies to check out, and VHF-Plus Editor Joe Lynch, N6CL, teams up with APRS developer Bob Bruninga, WB4APR, to describe a new type of ham radio balloon launch. Awards Editor Ted Melinosky, K1BV, looks at some easy-to-earn awards to help start or ramp-up your "wallpaper" collection; DX Editor Carl Smith, N4AA - a new inductee into the CQ DX Hall of Fame (Congrats, Carl!) 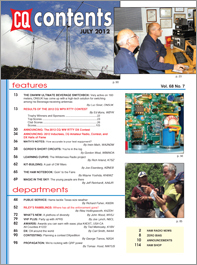 - writes about DXpeditions of note and other DX news; Contesting Editor George Tranos, N2GA, looks at "Planning a Contest DXpedition," and Propagation Editor Tomas Hood, NW7US, illustrates the benefits of CW vs. SSB in a variety of marginal band conditions. That's a brief look at what's coming up in the July issue of CQ magazine, which should be on newsstands and in subscribers' mailboxes by the beginning of July (the digital edition should be available as of July 1). For information on becoming a CQ subscriber - to either our print or digital edition (or both!) - click here! Zero Bias - "Doin' it Wrong, Gettin' it Right"